The leaves and the weather aren’t the only things that change when the temperature drops. Our tastes and cravings do some changing, too. Iced tea, berries and watermelon quickly shift into hot cider, pumpkin pastries and of course, hearty, satisfying soups. Here are some reasons why Tuttorosso loves soups for the cooler months, and some recipes to keep your family warm. Soup keeps very well and is fairly easy to make ahead. So it’s great to have on-hand for those “What are we having for dinner?” nights. 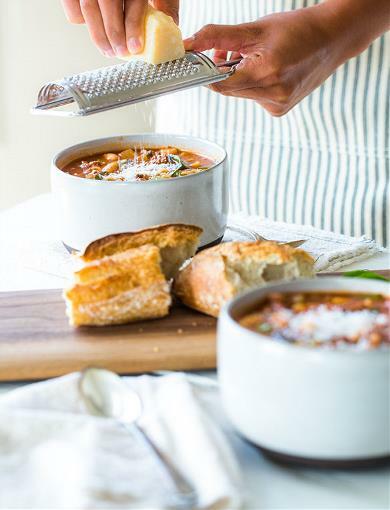 One of our favorites is our Pasta Fagioli recipe, which combines warm broth, lean beef, fresh herbs and other fresh ingredients. Filling, satisfying and Italian, this soup is great for a last-minute dinner. Some people seem to think that soup is simply a starter. But when you make a soup, stew or chili that’s filled with meat, beans and other fresh, protein-packed ingredients, it’s transformed into a filling entrée. 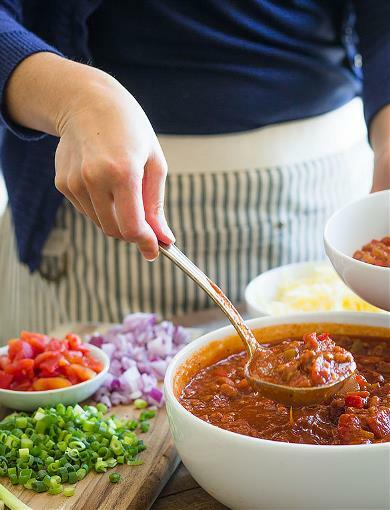 So whether it’s a weeknight dinner or tailgate treat, we recommend our Traditional Chili recipe if you’re looking for a crowd-pleasing, soul-warming meal. The other thing we love about soup is that most of them are very economical to make. Requiring just a handful of ingredients, soups are usually a budget-stretching way to feed a whole family something fresh and filling. 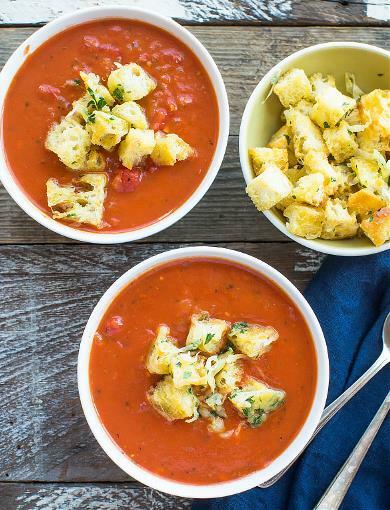 Our favorite affordable soup recipe is our Chunky Tomato Soup. Costing just over $1 per serving, this classic soup is expertly seasoned and surprisingly creamy. 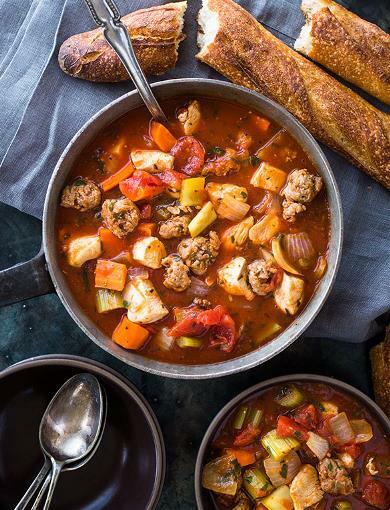 You can take a classic, familiar dish like Chicken Cacciatore and make it into a comforting soup. 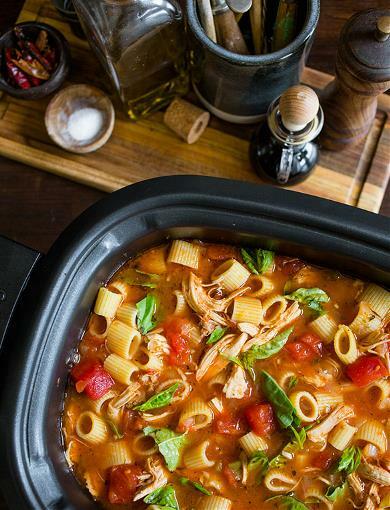 Our Chicken Cacciatore Soup is made in your slow cooker with all the flavors you get in the classic Italian dish; onions, peppers, chicken, tomatoes and pasta. Minimal prep is needed in order to have dinner ready at the end of a busy day. Can you think of a tastier way to warm up? Who says soup has to be boring? Go beyond tomato basil or chicken noodle; whip something up that’s both unexpected and unforgettable. Try our popular Chicken Sausage Stew, which includes hunks of chicken and sausage, chopped carrots and garlic cloves. 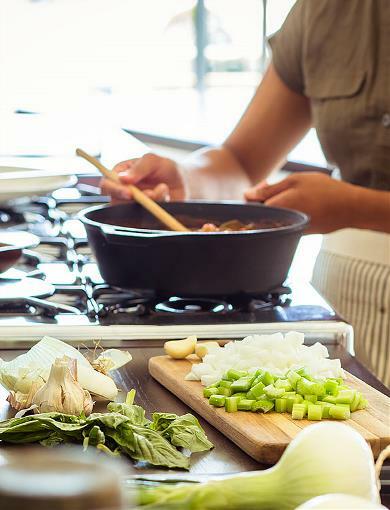 Add your own favorite vegetables, proteins or spices for even more adventurous palates. Certain ingredients just scream fall, like turkey and sweet potatoes. They’re the simple, classic flavors we all crave during this time of year. Our Sweet Potato Turkey Stew recipe is perfect for using Thanksgiving leftovers and beyond. With its unexpected seasonings that all work together to create a sweet yet savory flavor. It’s fresh, festive and filling.